Good morning! It’s the start of another week, and that means it’s time for another snippet from Issue 20! We’re mixing it up this time with one of our visual contributions (yes, we do accept visual submissions as well as prose and poetry). Christopher Savage is an artist and Master’s student at the University of Calgary. Here’s some of his work! Hello all! I know we promised to launch the interviews last Thursday, but hey, we’re new to this and it was reading week so we may or may not have misplaced the days of the week. Anyway, we’re back on track and very excited to launch the first of our bi-weekly contributor and grad student interviews! Our first interviewee is Paul Meunier, a Master’s student at the University of Calgary and a contributor in Issue 20. Paul is a born-and-raised Calgarian who holds a degree in photography from ACAD, and a degree in English from U of C. We sat down to chat with him about his poem series “community” and how his style of poetry relates to the conceptual poetry movement. On a more personal level, Paul wishes to thank his supportive husband, Matthew, for always picking up the pieces when Paul’s up late working on a poem, conference proposal, or essay. Where would us writers be without our loved ones cheering us on? Paul: “community”—small ‘c’—is a series of new poems, taken from a style of deconstructed anagrams I’ve been playing with for a couple years. “community” is a negotiation of the disappearance of queer establishments in Calgary, but not necessarily from a positive or negative angle. It’s about relationship, my own relationship with Calgary’s queer community. This year we celebrated the largest gay pride parade in the history of our city, yet all these bars, pubs, and gathering places for queer people keep opening, then closing. It’s an interesting symptom of the evolving needs in our queer community. Allie: Is there a disconnect between the people and these places? Paul: It’s a time of change. These places were quite formative for me—I visited these establishments during my formative years when I came out—but the community and cultural needs are adapting. People need gathering spaces/places for different reasons, and so I’m exploring my own personal relationship with this history. Allie: How do you reflect this, not tension, but interaction in your poems? Paul: in “community” I’ve used anagrams composed of letters in the names of ten bars and pubs—places that I used to go to—that have since shut down. And I used the letters from all these names to create a collective alphabet, which then forms the vocabulary for very specific, place-based memories I had in each establishment. For example, “Victoria’s” used to be a restaurant on 17th Avenue and 2nd Street SW, and I write of ice cream and dining. In “Metro Boyztown” I imply leaning over a bar counter that’s sticky from all the overfilled drinks. Then as each place disappears, the letters from its name disappear with it, and the available vocabulary for the next poem is reduced. The poems gradually erase themselves, and as each establishment’s name is removed and the poetic language disappears, the tenth poem, “community,” is all but erased. I think this constraint works really well to showcase my sense of loss, without creating a series of poems that might otherwise come off aggressive. Paul: Yeah, conceptual poetry can sometimes be heavy-handed, when the constraint becomes more important than the subject matter. Sometimes conceptual poets can overstep their bounds, especially when appropriating the experiences or stories of communities who’ve been historically marginalized. In my own writing, I hope I can pay tribute to the voice of a community I relate with, and seek to represent. I want my work to be accessible to the queer community, and to reflect our experiences in a way that a removed, academic approach might otherwise feel distant from. That said, I write about a lot of other things besides the queer community, but that’s what this current series is focused on. For “community” I really focused on my own personal experience and located myself in the vanished establishments, but these identity politics are not my only lens. I’m trying to explore how this perspective relates to the nature of constraint-based conceptual poetry, but I can—and even like to!—dabble in other forms and genres. Allie: Why is your subject position so central to your conceptual poetry, though not necessarily as much to other forms? Paul: It’s my way of addressing the current accusations that conceptual poetry has faced, as a movement. Many writers have appropriated other voices in the name of conceptual work—and this often happens with “found poetry” being recontextualised inappropriately. I want to solidly place myself exactly where I am, give voice to myself and my experiences, and maybe reach other people around me who feel similar. 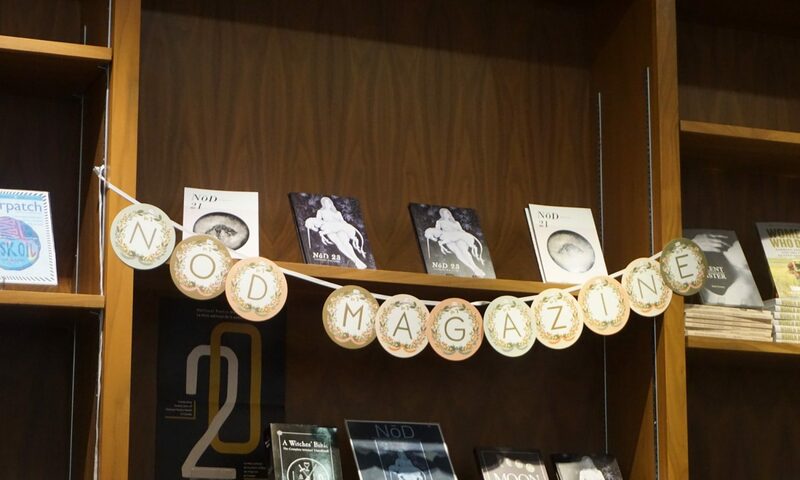 One of the most unexpected moments for me was during Nōd’s Issue 20 launch. I read “community” there—as well as “Hate Speech” which I wrote just days before the launch—and afterwards someone came up to me and said they too had been mourning the loss of all these establishments, and that they connected with the performance. This person was pleased to hear poetry that called attention to the loss of all these establishments, and that was an emotional moment for me. I want to bring community into poetry, and the best way for me to do that is to write for myself, and not solely for the sake of experimentation. Allie: You’ve mentioned your poem “Hate Speech,” how does that poem compare stylistically to “community”? Paul: “community” reflects my constraint-based practices, and my visual background a lot more than “Hate Speech.” In “community,” the vanishing effect is most evident when you see the poems on the page and see how the letters fade, which I find is a great marriage of form and content. “Hate Speech” is a lyric poem. There are no constraints, though I couldn’t help but try to write with an attention to phonemes. This poem was created after two incidents: a protest that I heard about on U of C campus campus where anti-gay pamphlets were handed out to the public, and when white supremacy stickers appeared on the Lions Park c-train station after the American election. In preparation for Nōd’s Issue 20 launch, it seemed appropriate to write something new, using a rhythm that compels the content to be read aloud. This type of performativity in my work is new to me—I’ve spent so much of my writing working on the lines and visual layout on the page. My focus on musicality in “Hate Speech” is different than previous work, but also kind of similar because it emulates how form and content play off one other. Allie: Thank you for sharing your thoughts on your work and your writerly approach with us! Paul: Thank you for having me! Happy Monday! This week’s snippet from Issue 20 is “Phoenix” by E. V. Bell, an American poet living and teaching in Prague. it will rise from its ashes? at the sight of burning matches. Another update for our supporters and writerly community: starting next Thursday we will be launching bi-weekly interviews with contributors and/or grad students in the Calgary area. These interviews will alternate with the Editor Features so be sure to check our page every week! Thank you for all your support, we couldn’t do it without you! Hello all! As promised, here is our first Editor Feature. Amy LeBlanc is our Editor in chief and is completing her English Honours degree this year. This feature piece is a brief excerpt from her Honours project– a creative endeavour that discusses issues of feminism and food through prose/poetry. (As a side note, if you’re in Calgary and want to hear more of this piece, Amy will be presenting a larger excerpt at the U of C on March 18). My mother told me that she was pregnant with twins when she had me. With Vanishing Twin Syndrome, there generally are no warning signs; one week– two heartbeats, next week– just one. The missing embryo usually dissolves back into the mother’s body. In rare cases, the second twin absorbs and consumes the embryo. Their skin cells can contain hair, teeth and bones from the second fetus (eyes, torso, hands, feet, and other limbs, only in the rarest cases). Small pockets often remain undiscovered until much later in life. They rarely occur in other mammals, but can be found in the occasional mountain lion. Hello! This week we bring you another snippet of Issue 20–a poem by Sara Wilson! to flower even the frosts. Hello! This week’s Issue 20 feature is a poem by Erin Emily Ann Vance– a Master’s student here at the U of C.
The blanket stained with pink.